The potential of technology to reduce isolation experienced during student teaching appears promising. Previous studies have explored strategies to obtain student teacher responses using telecommunications. This study examines over 700 entries of secondary student teachers (n=18) and faculty relating to readings, projects, and daily experiences in schools through an electronic discussion group. From analyses, two categories emerged: challenges and accomplishments. Discussions were more open, scholarly, and reflective than anticipated and the group provided needed support for students facing difficulties. Samples of postings and topics are reported. Recommendations for enhancing reflectivity among participants and improving use of a technological discussion group are made. Devlin-Scherer, R. & Daly, J. (2001). Living in the Present Tense: Student Teaching Telecommunications Connect Theory and Practice. 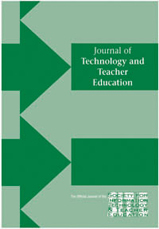 Journal of Technology and Teacher Education, 9 (4), 617-634. Norfolk, VA: Society for Information Technology & Teacher Education. Retrieved April 25, 2019 from https://www.learntechlib.org/primary/p/8411/.